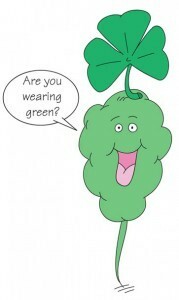 Tomorrow is St. Patrick’s Day, a day when lots of people are showing their Irish pride by wearing green. Lucky for me, I’m already green, so I find other ways to display some Irish pride. The way I do it is by bringing all-green food for lunch and snack! Well, mostly green. For snack I’ll bring celery, a Food of the Month, with peanut butter. For lunch, I have a spinach salad with chicken, green grapes, and some sugar-snap peas with a low-fat drink. To complete my green-theme, my parents are helping me make a kale-apple smoothie to bring as a drink. Happy St. Patrick’s Day! Oh, and don’t forget to download your coloring sheet for today!